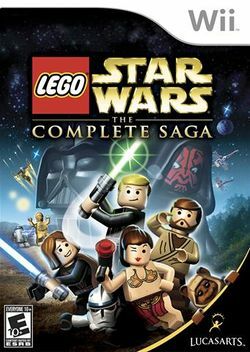 LEGO Star Wars: The Complete Saga is a video game based on the Star Wars-themed toy line by the LEGO Group. It is a combination of the game LEGO Star Wars: The Video Game and its sequel LEGO Star Wars II: The Original Trilogy. The game was announced by LucasArts on May 25, 2007 at Celebration IV and was released for the Xbox 360, PlayStation 3, Wii and Nintendo DS on November 6, 2007 in the US. The game takes place from "the Trade Federation's negotiations" with Obi-Wan Kenobi and Qui-Gon Jinn in The Phantom Menace to the space battle above Endor in Return of the Jedi. The "Gunship Cavalry" and "Mos Espa Podrace" levels have been redesigned, although the original versions are still in the game as bonus levels. However, "Battle over Coruscant" remains the same except that players can change vehicles in free-play. A brand new 2-player Battle Arena mode has been added, called "arcade mode", new vehicle bonus missions, the red power bricks from LEGO Star Wars II, and 10 additional bounty hunter missions add new challenges to the Prequel Trilogy portions originally seen in LEGO Star Wars: The Video Game. The episode I-II-III levels have been updated so that characters can build and ride vehicles, wear helmets and gain access to bounty hunter areas, and those characters now have the ability to dodge blaster fire and have their own special melee attack (for example, Chewbacca rips off arms). New Jedi Force moves are included (force lightning and force choke). New characters have also been added, bringing the total up to 160. Indiana Jones is an unlockable playable character (to foreshadow LEGO Indiana Jones: The Original Adventures). This page has been accessed 50,627 times.